So at the moment I don’t have any medical insurance (shame on me, it expired last month.) Just the other day, in a very uncoordinated first attempt to snowboard down Mt. 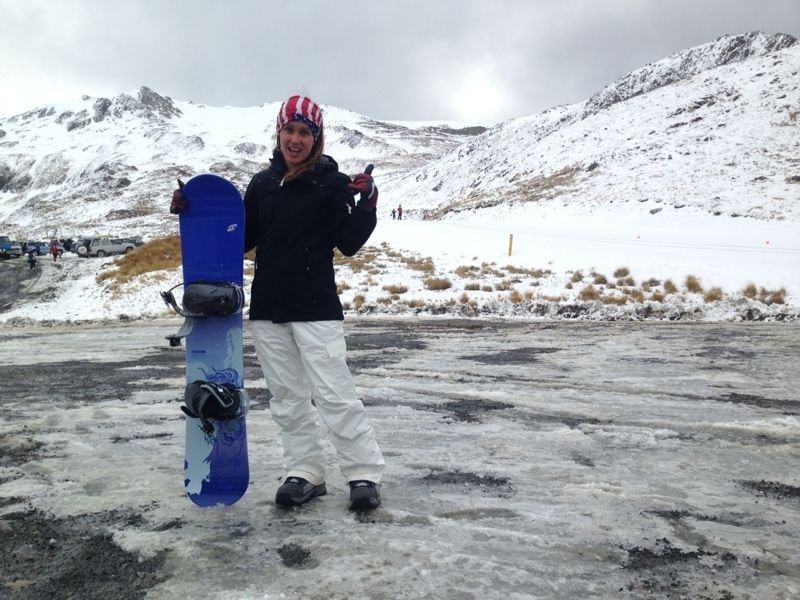 Taranaki’s bunny slope, I stuffed-up a basic toe-turn and landed with full force on my freakishly puny wrist. My first thought was, “It’s broken,” directly followed by, “I don’t have health insurance.” I was ready to panic, but then I wiggled my fingers, (bones intact!) and a volunteer in the ski-lodge bandaged me up (free of charge!). Still, I was worried that my feeble radius might be fractured and that my bank account might soon be under siege. I opted for the ‘wait and see’ approach to avoid any unnecessary medical bills, but three days later when I was back in my waitressing uniform, my wrist was still giving me grief. When my boss saw my bandage-wrapped wrist and found out that I hadn’t yet been to the doctor, he went rifling through the Yellow Pages, put me on the phone with a local medical center and told me to make an appointment on the spot. I insisted on waiting until the end of the day, but he declared that my health was more important than my job (imagine that!). When I finally confessed that I didn’t have health insurance, he put me on the phone with the Accident Compensation Corporation (ACC) and my worries were no more. Through the ACC, everyone in New Zealand – citizen, temporary resident and tourist alike – is eligible for 24-hour, seven-day-a-week, no-fault comprehensive injury coverage, complete with interpreters for 30 different languages. No matter what you’re doing or where you are, no matter who might be at fault and even if you did something yourself to contribute to the accident, you’re covered on New Zealand soil. As a result, you cannot sue for personal injury (except for exemplary damages) – the ACC scheme acts a replacement and eliminates the need to take legal action. Armed with this newfound knowledge, I left work and headed straight to the local medical center. Approximately 45 minutes and a mere $55 dollars later with my automatic ACC assistance, I left the clinic with a new bandage and an x-ray confirming what a wimp I am – no fracture, no plaster-cast in my future, just a bit of cloth bandage and some Panadol to ease the pain. I felt incredibly relieved to have instant and conclusive results without a mountain of medical bills in their wake. While my injury amounted to little more than a sprain, the ACC covers all sorts of accidental injuries – from breaks and strains to amputations and dislocations. The stipulations for assistance are clear-cut and the protocol is simple: If you have an accident and you need medical treatment, it will be available at a reasonable cost. As an American, this blew my mind. Can you imagine if I had been at home in St. Pete, wake-boarding on rented equipment in the Gulf without insurance and I broke my wrist? The first question on everyone’s mind would be, ‘Is she going to sue the rental company?’ The last phrase you would expect to hear is ‘affordable medical coverage.’ Worse still, can you imagine what would happen to a foreigner who did the same thing? Of course travel insurance comes into play, but you only get reimbursed after you’ve paid for everything up front, and claims can take months to settle with all of the paperwork and back-and-forth documents. Even then, coverage can be very limited and the policy wording unclear, leaving you without compensation. I know this from first-hand experience. There is nothing easy or straightforward about travel insurance. The ACC on the other hand is absolutely brilliant. Some might think that New Zealand’s public health care system is perhaps too generous, but I whole-heartedly disagree. The munificence of the ACC is what makes it an effective and successful system. Basically the ACC scheme is funded by a small tax paid by employees, employers and self-employed people on earnings. The ACC Motor Vehicle Account covers claims for all injuries involving motor vehicles on New Zealand’s public roads and is funded by a levy included in the price of petrol and the motor vehicle licensing fee. But before you go getting all hot and bothered about whose tax dollars are paying for whose treatment, remember that you get what you give. That’s not to say that some people don’t benefit more than others, that some people don’t contribute as much, that some people aren’t still at a disadvantage, but overall the ACC seems to adequately serve the majority. Isn’t that the point? Of course, health care for Aotearoa’s population of 4.4 million is probably a bit easier to manage than America’s 313 million residents, but the principles are what make it work – the well-being of the people is valued and their needs are taken care of at a fair cost. When you find yourself injured in an accident in New Zealand, there are no pending law suits to settle in order to cover your medical bills. All of your time and your money can be allocated to treatment and recovery. 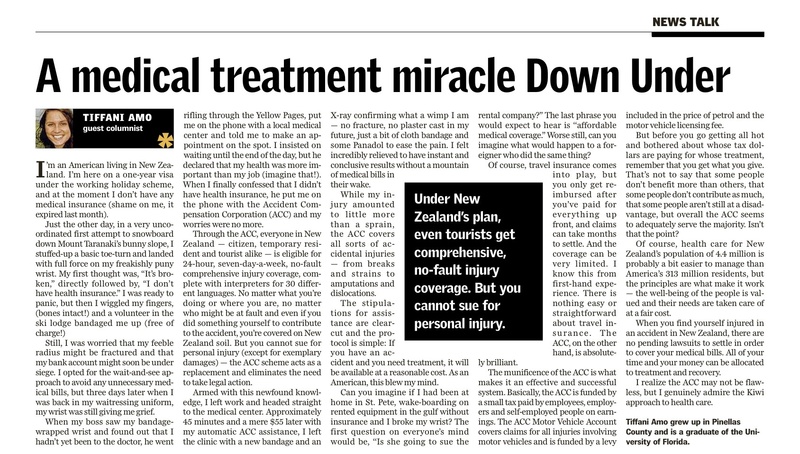 I realize the ACC may not be flawless, but it is absolutely a role-model system, and I genuinely admire the kiwi approach to health care.